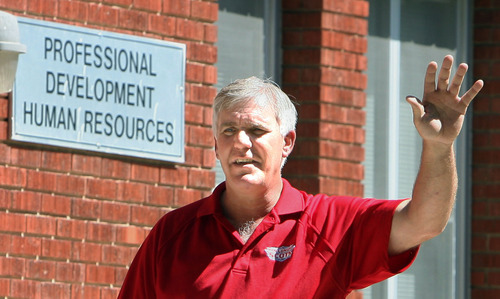 Protest • District refused to negotiate 2011-12 contract; other unions offer support. 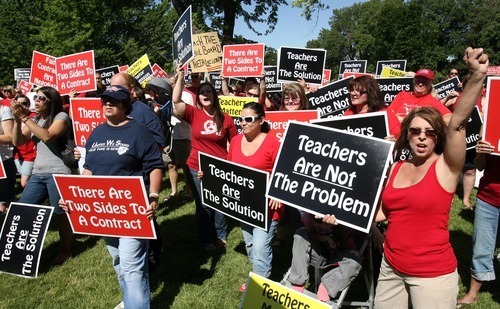 Steve Griffin | The Salt Lake Tribune Ogden School District teachers and supporters gather at Liberty Park in Ogden on Thursday rally for collective bargaining rights. 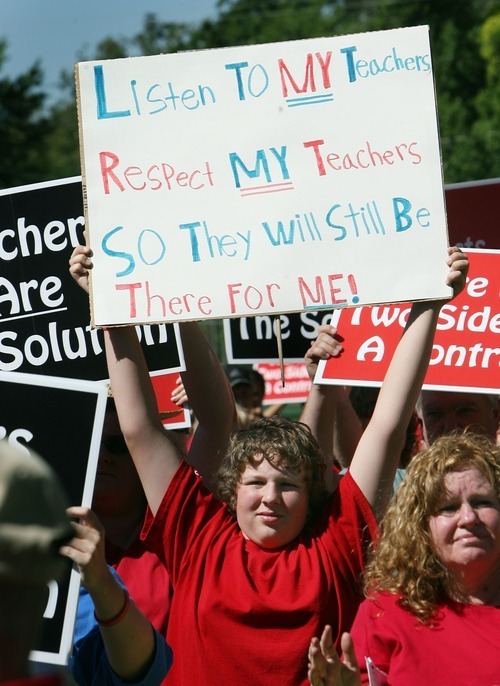 Steve Griffin | The Salt Lake Tribune Kyle Speckman, 14, holds up his sign in support of teachers during a rally at Liberty Park in Ogden on Thursday, July 14, 2011, in support of collective bargaining rights. Speckman will be a ninth-grader at Highland Junior High this year and he worries that teachers might leave the Ogden School District. Steve Griffin | The Salt Lake Tribune Doug Stephens, Ogden Education Association president and U.S. history teacher at Ben Lomond High School, speaks to teachers and supporters during a gathering at Liberty Park in Ogden on Thursday, July 14, 2011. Steve Griffin | The Salt Lake Tribune Ogden School District teachers and their supporters gather at Liberty Park in Ogden on Thursday, July 14, 2011, to rally for collective bargaining rights. Steve Griffin | The Salt Lake Tribune Ogden School District teachers and their supporters gather at Liberty Park in Ogden on Thursday, July 14, 2011, to rally for collective bargaining rights. The Ogden Board of Education refused to negotiate with the Ogden Education Association for a 2011-2012 contract. The district sent a letter to its teachers requiring that they sign an individual contract by July 20, 2011, or they will lose their jobs. Steve Griffin | The Salt Lake Tribune Doug Stephens, Ogden Education Association president and U.S. history teacher at Ben Lomond High School, waves to teachers and their supporters after delivering nearly 100 contract questions to district offices following a rally at Liberty Park in Ogden on Thursday, July 14, 2011, for collective bargaining rights. Ogden • Wearing red T-shirts and waving black-and-white signs, an estimated 800 people rallied in Ogden's Liberty Park on Thursday to protest the city school district's decision to not negotiate a contract with its teachers union. 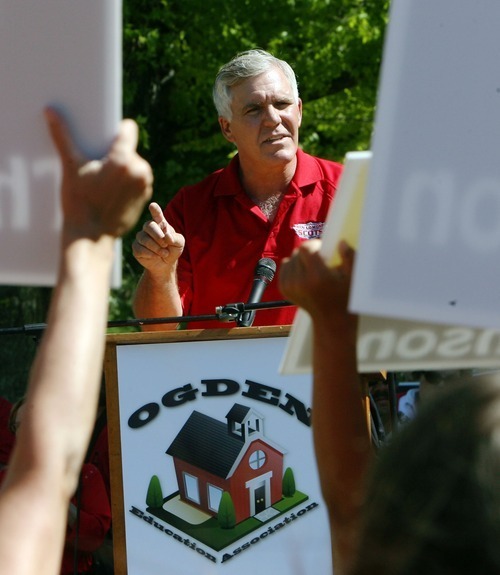 Those joining the crowd were not just members of the Ogden Education Association (OEA). Standing alongside Ogden teachers were educators from Washington County to Logan and a range of union members, including teamsters, machinists, federal government employees, plumbers and the AFL-CIO. They rallied around a common cry: Preserve collective-bargaining rights. "Some of these politicians want to silence the voice of teachers. In fact, they want to silence the voice of all workers," said Greg Johnson, an executive committee member of the National Education Association who flew in from Oklahoma to speak at the rally. "If they're successful, there will be no strong voice to stand up and fight for the middle class. … And there will be no one to stand strong for the students in our classrooms." Earlier this month, the Ogden School District notified teachers that they must sign individual contracts by 4 p.m. Wednesday  or forfeit their jobs. Classes in Ogden are scheduled to begin on Aug. 24. The district's demand followed a breakdown in negotiations on a contract agreement for last school year, prompting the Ogden Board of Education to refuse to negotiate with OEA on a 2011-12 contract. "It's an ultimatum and it's wrong," said Jenny Brown, president of the Ogden chapter of the National Treasury Employees Union, which serves Internal Revenue Service workers. "Our teachers are everything. 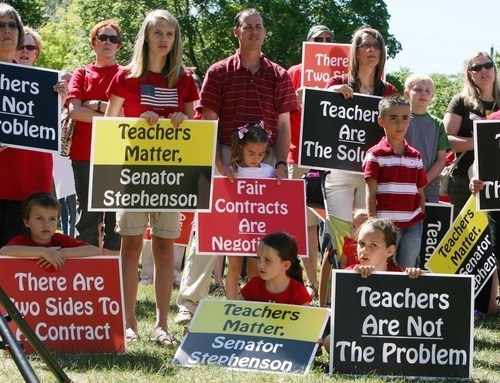 … Without these teachers, we wouldn't have been able to get the jobs we've gotten." After Thursday's rally, hundreds of Ogden teachers and their supporters marched to district offices a block away to deliver nearly 100 questions that teachers want answered about the contract before they sign. Ogden Superintendent Noel Zabriskie said in an interview Thursday that the district would do its best to answer those questions before Wednesday, when teachers must return the contracts. Half of Ogden's 700 teachers already have signed contracts, he said. The district also has announced that, in two years, it will begin replacing raises based on experience, known as "steps," with raises based on performance  a move it hopes will improve education in Ogden classrooms. The OEA does not oppose merit pay but has been wary of the district's plan because the specifics have not been decided. That plan is not part of the 2011-12 contract. At the rally, Ogden kindergarten teacher Kaye Strong called the district's contract ultimatum "bullying at its finest." Many expressed frustration with the district's approach. "Fear, compulsion, force, those things never, never  and I teach history  they never produce good results," said Doug Stephens, president of the Ogden Education Association, at the rally. "I say again to the Ogden School Board, let's return to the table. Let's work together." Stephens has called on the board to restore collective bargaining for this school year and into the future. And a thousand people have signed a written petition echoing that request. About 750 of those signatures were gathered at Thursday's rally. More people are signing online at http://www.utahsfuture.org/petition. But the decision not to negotiate this year's contract is a "done deal," said Ogden Board of Education President Don Belnap in an interview Thursday. He disagreed, however, with complaints that the board is stripping teachers of their collective bargaining rights. "We've never said we would not resume collective bargaining. It's part of the new contract [that bargaining resume next year]," Belnap said. "We just reserve the right to determine who we're going to collective-bargain with. Why does it have to be the OEA leadership?" Belnap said the board wants to negotiate with "all teachers," not just members of the association. The OEA reports that about 500 of the district's 700 teachers belong to its ranks. "We've chosen to move on in a positive direction, giving our employees a [1.6 percent] cost of-living increase, because we care about them and know we've had some tough times," Belnap said. "We care about our teachers. We want them to be happy." This is the third consecutive year the district has not funded steps, but it did make some adjustments to the schedule that resulted in an additional raise for most teachers. The district's total cost for salary increases is $864,000. But it wasn't enough to keep math teacher Rachel Lee at Mount Ogden Junior High. In May, as contract negotiations unraveled, she applied for and got a job in neighboring Weber School District. She wanted to be able to pay her bills, she said, and was frustrated by the turmoil between the OEA and district leaders. "I feel like we're disposable to them. They don't care about collaborating," she said in an interview at Thursday's rally. 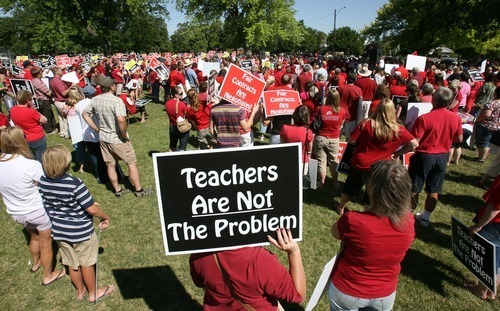 "I hope they can understand what they're doing to teachers is not good for students." Fourteen-year-old Kyle Speckman worries he could lose some of his favorite teachers at Highland Junior High because of the contract dispute. He wore red to Thursday's protest to show solidarity with teachers, and raised a hand-written sign that read, "Listen to my teachers, respect my teachers, so they will still be there for me." Speckman is skeptical of a performance-based pay system, which would take student test scores and improvement into account. "Some students and parents don't care if they get good grades  or if they even show up for school," Speckman explained. "If teachers leave, its just a hassle to have to hire new teachers all because [board members] wouldn't agree with one stinking contract." Percentage who are ethnic minorities • 54. Percentage who qualified for free or reduced price lunch in fall 2010 • 73. Graduation rate for Class of 2010 • 70 percent. Graduation rate for Class of 2010 throughout Utah • 90 percent.